Pan-fry ginger and onion for about 5 minutes without oil. Leave aside. Put water in a medium pot, boil beef bones, sliced meat and beef brisket over high heat. Add pan-fried ginger and onion. Add star anise, cinnamon and salt to the pot. Lower fire and simmer for about 1 hour until meat becomes tender. Remove beef bones and meat from the broth. Slice meat thinly. Strain and put beef broth into another pot. Add in fish sauce, sugar, salt and pepper. Simmer for 5 minutes. In another pot with clean boiled water, blanch taugeh and noodles of your choice and rinse through cold running water. Strain. Put noodles and taugeh in a serving bowl. Put sliced meat on top of noodles, and sliced onions. 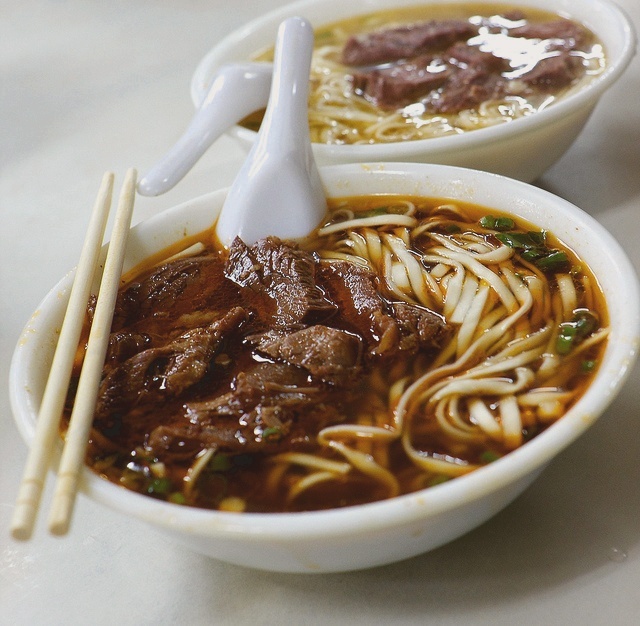 Pour hot beef soup to the bowl of noodles. Garnish with sliced chillies, coriander leaves, mint leaves and saw herb leaves. Add a dash of pepper to serve with calamansi aside. It’s totally different from the authentic Vietnamese beef noodles I tried in Vietnam.